In the year following the EU Referendum, I wrote a number of posts utilizing Chris Hanretty’s estimates of the vote split by constituency for England and Wales. Hanretty estimates that 421 of the 573 constituencies in England and Wales voted to leave. These estimates were necessary as the vote was counted by different – and mostly larger – areas than the parliamentary constituencies. Politically, my major conclusion was that it was the Labour Party who could potentially suffer more from Brexit. There are two major reasons for this situation. First, is that the Labour constituencies had a far greater spread of views than the Conservative constituencies. This is in both the divergence between regions and the disproportionate numbers of constituencies that are were either extreme Remain or extreme Leave in the referendum. Figure 1 is for the result for constituencies with Conservative MPs in 2016, and Figure 2 for constituencies with Labour MPs. Figure 1: Constituencies in England and Wales with Conservative MPs in 2016, by estimated Leave or Remain Band. Figure 2: Constituencies in England and Wales with Labour Party MPs in 2016, by estimated Leave or Remain Band. In particular, London, where much of the current Labour Leadership are based, has views on the EU diametrically opposed views to the regions where most of the traditional Labour vote resides. Further analysis, from July 2016, is here. Second, is the profile of the Leave supports. 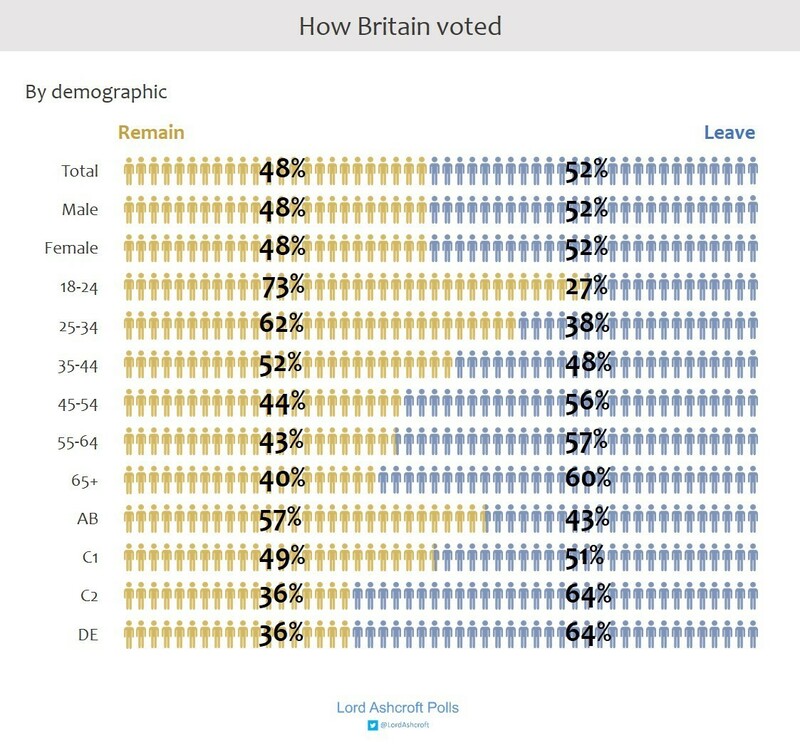 Based on an extensive poll conducted by Lord Ashcroft on EU Referendum day, Leave support was especially strong on those retired on a State Pension, council and housing association tenants, those whose formal education did not progress beyond secondary school, and the C2DEs. That is, groups that traditionally disproportionately vote Labour. Further details, from May 2017, are here. Yet, the results of the snap General Election in June 2017 suggest that it was the Conservatives that suffered from Brexit. Despite their share of the popular vote increasing by over 5%, to the highest share in 25 years, they had a net loss of 13 seats and lost their majority. Labour increased their share of the vote by 10%, but only had a net gain of 30 seats. Do the positions on Brexit appear to have had an influence? The Conservatives were seeking a stronger mandate for the Brexit negotiations, whilst Labour strongly avoided taken a firm position one way or the other. Chris Hanretty has revised his estimates, with the number of Leave-majority constituencies in England and Wales reduced from 421 to 401. The general picture is unchanged from the previous analysis. I have taken these revised figures, put them into the eight bands used previously and compared to the full election results available from the House of Commons Library. The main seat results are in Figure 3. Conservatives had a net loss of 25 seats, 14 of which likely voted Remain in the EU Referendum and 11 likely voted Leave. Remain seats reduced by 18% and Leave seats by 4%. All 6 gains from Labour were in strongly Remain constituencies. This includes Copeland, which was gained in a by-election in early 2017 and retained in the General Election. Labour had a net gain of 24 seats, 13 of which likely voted Remain in the EU Referendum and 11 likely voted Leave. Remain seats increased by 16% and Leave seats by 7%. Figure 4 is the average percentage change in the constituency vote from 2015 to 2017 for the Conservative Party. The estimated Referendum vote is a strong predictor of change in Conservative Party vote share from 2015 to 2017 General Election. Figure 5 is the average percentage change in the constituency vote from 2015 to 2017 for the Labour Party. Overall average constituency vote share increased by 10% on the 2015 General Election. In the 6 seats lost to the Conservatives, Labour’s share of the vote increased. In every area, Labour increased its share of the constituency vote with one exception. In the 6 seats that the Liberal Democrats gained from the Conservatives, the Labour share of the vote was on average unchanged. This suggests some tactical voting. In Conservative “hold” seats Labour’s increase in vote share did not have a “Remain” bias. In Labour “hold” seats Labour’s increase in vote share had a strong “Remain” bias. In summary, it would appear that the Conservatives in implementing Brexit have mostly suffered at the ballot in Remain areas. Labour, in being the Party of Opposition and avoiding taking a clear position on Brexit, benefited from the Remain support without being deserted by the Leave vote. I will leave it for another day – and for others – to draw out further conclusions. Whilst writing the above, I was unaware of a report produced by political pundit Prof John Curtice last December Has Brexit Reshaped British Politics? In the 2017 election the Conservatives gained support amongst Leave voters but fell back amongst Remain supporters. Labour, in contrast, advanced more strongly amongst Remain than amongst Leave voters. That is pretty much my own findings by a different method. Both methods can produce different insights. My own approach can give regional analysis. The results show two things. 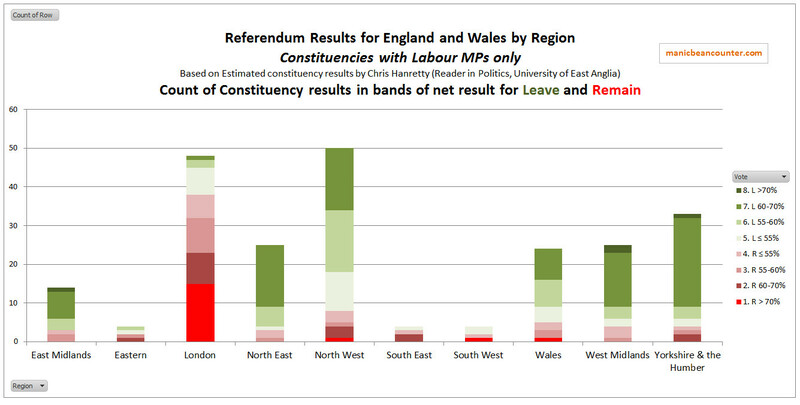 First is that there is a huge divergence in Referendum vote across the English and Welsh constituencies. Second is that a disproportionate number of the constituencies with strong votes either for remaining in the EU or leaving the EU have a Labour Party MP. The second post looked at the seats that Labour must win if it is to become the largest party at the next General Election. In England and Wales most of the target seats voted to leave the EU. But in Scotland, where Labour lost 40 seats to the SNP, every single constituency likely voted to remain in the EU. Further in London, which was strongly remain, reside about 40% of Labour members. There is a fundamental split. One of the most Pro-Leave constituencies is Stoke on Trent Central. Pro-Remain Labour MP Tristram Hunt is resigning to take up the prestigious post of Director of the V&A Museum. Guido Fawkes had a post this afternoon TRISTRAM HUNT ON LABOUR’S EXISTENTIAL CRISIS. During the EU Referendum campaign all the main political parties backed the Remain campaign. The opinion polls predicted a final 52/48 split for the Remain vote. The final vote was 52/48 win for leaving the EU, sending shock waves around the world. This seems quite a narrow win. However, Chris Hanretty, a Reader in Politics at the University of East Anglia, has estimated the referendum vote split for the 574 parliamentary constituencies in England and Wales. The actual vote also covered the 76 constituencies in Scotland and Northern Island, along with Gibraltar. This was not a simple task, as the vote was counted by local Government areas, which rarely coincide with the constituencies. He estimated that 421 of these 574 constituencies likely voted for Leave. However, there was no geographical split of the figures. I therefore classified the constituencies by region, along with putting the estimated vote into bands, with shades of green for a majority to Leave the EU and shades of pink/red for a majority to Remain in the EU. There is a huge divergence between the regions. London was the only region to vote Remain in England and Wales, with 71% of constituencies in favour. The next nearest pro-EU region was the South East, with 39% of constituencies in favour. Furthermore London accounted for 22 of the 26 constituencies with greater than 70% of the vote in favour of Remain. What is quite worrying for future political consensus is that in 39% of constituencies the vote was at least 60% for a position for the majority vote. The split by political party is also revealing. Of the 574 constituencies, 330 have Conservative MPs, 231 have Labour MPs and the remaining 12 seats are split between four other parties. The Conservative constituency split is as follows. The Conservative support is mostly in the South of England and the Midlands. The divergence is slightly less extreme than for the total, with 94 of the 330 constituencies having at least 60% for the majority vote. The Labour Party constituency split is as follows. The Labour Party support is mostly in the North of England, the West Midlands, London and Wales. The divergence in vote is more extreme than for the total, with 123 of the 231 constituencies having at least 60% for the majority vote. Over half of the constituencies with a greater than 60% Remain vote in England and Wales (34 of 54) are Labour. Also over half of the constituencies with a greater than 60% Leave vote in England and Wales (89 of 168) are Labour. Yet Labour have just 40% of the Parliamentary seats. What is worse for the Party, the divergence is regional. The Remain constituencies are concentrated in London. All the other core regions have a strong Leave vote. Even worse, the Party activists are strongly Remain supporters and are behind efforts to annul the Referendum result. In summary the results show two things.